Move over, Florida — Minnesota is making a strong bid for supremacy in the category of freakishly close electoral results. CNN reports today that Sen. Norm Coleman’s unofficial lead over unfunnyman Al Franken has shrunk to a mere 5 votes, out of about 3 million cast. If that holds up — the state is continuing to analyze the ballots — that would be a margin of victory of about 0.00016%, or less than two ten-thousandths of one percent. Florida 2000 was a veritable landslide in comparison, with a final certified Bush margin of 0.009%, nearly one-hundredth of one percent, or 537 votes out of just under 6 million cast. It’s hard to know what to do about a dead heat in a large election. An election that close is well within the measurement error of any method that could be used to count votes. In Minnesota as in Florida, we’ll never know which candidate actually received more votes. It’s tempting to provide for redoing the election if it’s within, say, 1% … but all that does is move the goalposts, so that the lawsuits and recounts attempt to prove that the margin was more or less than precisely 1%. Florida 2000 was a national tragedy — not because of who won, but because the closeness inevitably called the legitimacy of the result into question. If the U.S. Supreme Court had voted 5-4 to declare Gore the winner, the bitter cries of “we wuz robbed” would have been coming from the other party. BTW, what kind of coin is that? Note: I find the idea of a statistical tie to be an interesting one. ollie, it’s an Australian 20 cent coin. 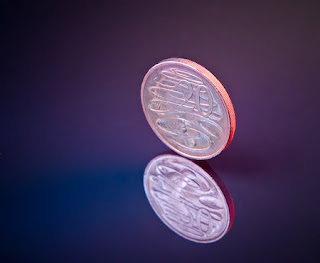 It was one of two suitable images I found when I did a Google image search for coin standing on edge. The other image was a U.S. penny, which as a patriotic ‘merican I would have preferred to use. But it was from a stock photo house and would have cost $49 to purchase the rights. My new BFF Zeophoto in Australia was willing to license his image for the price of a link.